Indiana State University's Scott College of Business has scholarship opportunities for entering freshman, continuing, and graduate (MBA) students. To submit your information for a college-wide scholarship, review the Application Process below. Deadlines for the Scott College scholarships are listed below - the application process has changed for the entire university - you will be applying through an ISU system call Academic Works. 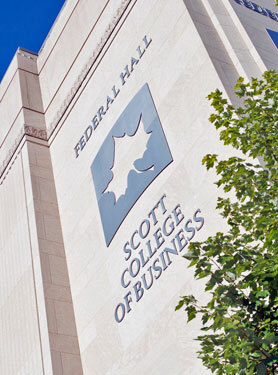 This scholarship information and online application pertain to all Scott College of Business non-program scholarships for continuing and MBA students. Continuing students who wish to apply for a scholarship in their major area should contact the department chair or for application procedures. Applications for other fall 2015 incoming freshman scholarships are automatic, i.e. be admitted to ISU as a business major and your eligibility for scholarships will be reviewed by the Admissions Scholarship Office. Read the Scholarship Application Process to learn about the overall process. This document will explain what you need to do to create a complete application. It also describes the guiding principles used to determine recipients. Starting in 2015, all materials are to be sent through the online scholarship application above. THIS IS A CHANGE FROM PRIOR YEARS AND WHAT APPEARED HERE EARLIER.